203 Commonwealth is located on the north side of Commonwealth, between Exeter and Fairfield, with 199 Commonwealth to the east and 205 Commonwealth to the west. 203 Commonwealth was designed by architect Louis Weissbein and built in 1884-1885 as the home of Leopold Morse (born Maas) and his wife, Georgiana (Georgie) Louisa (Ray) Morse. They previously lived at 85 Beacon. Leopold Morse’s unmarried brother, Godfrey Morse, lived with them. The land on which 203 Commonwealth was built was purchased from the Commonwealth of Massachusetts on March 20, 1883, by banker and former shipping merchant Samuel Endicott Peabody. On the same day, he also purchased the lot immediately to the west, where he built 205 Commonwealth as his home. 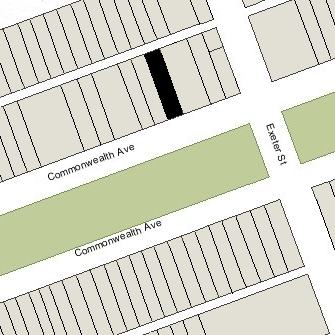 On June 13, 1883, he sold the lot where 205 Commonwealth would be built to Henry Melville Whitney. He was a coal and iron manufacturer and president of the Metropolitan Steamship Company and the West End Street Railway Company. He and his wife, Margaret Foster (Green) Whitney, lived in Brookline. On September 18, 1883, Leopold Morse bought the land from Henry Whitney. Click here for an index to the deeds for 203 Commonwealth. Leopold Morse was a wholesale and retail clothing merchant. He served twice in Congress, from 1877 to 1885, and from 1887 to 1889, the first Jew elected to Congress from Massachusetts. In 1889, he and his brother, Godfrey, founded the Home for Aged and Infirm Hebrews and Orphanage in Milton. Leopold Morse died in December of 1892. Georgie Morse continued to live at 203 Commonwealth with their two surviving sons, Isidor Morse and Tyler Morse. Godfrey Morse also continued to live with her. In his will, Leopold Morse named Isidor and Tyler Morse as his residual legatees and, therefore, they each inherited a one-half undivided interest in 102 Commonwealth. As each of them reached their majority, they transferred their interests to their mother, Isidor Morse on April 17, 1894, and Tyler Morse on February 11, 1896. Isidor Morse moved to London in the fall of 1895. Tyler Morse graduated from Harvard in 1898, attended Harvard Law School, and became a lawyer in Godfrey Morse’s firm. He continued to live at 203 Commonwealth. In the spring and summer of 1903, Tyler and Isidor Morse joined an expedition to Africa organized by William N. MacMillan of St. Louis to explore the Blue Nile and determine whether if could be a navigable route to the Mediterranean. Tyler Morse married in January of 1906 to Mrs. Allon (Fuller) Black of New York City, the former wife of Harry S. Black. After their marriage, they lived in New York. Godfrey Morse married in January of 1907 to Mrs. Janet (Jennie) (Rosenfeld) Conrad, the former wife of Sidney Smith Conrad. 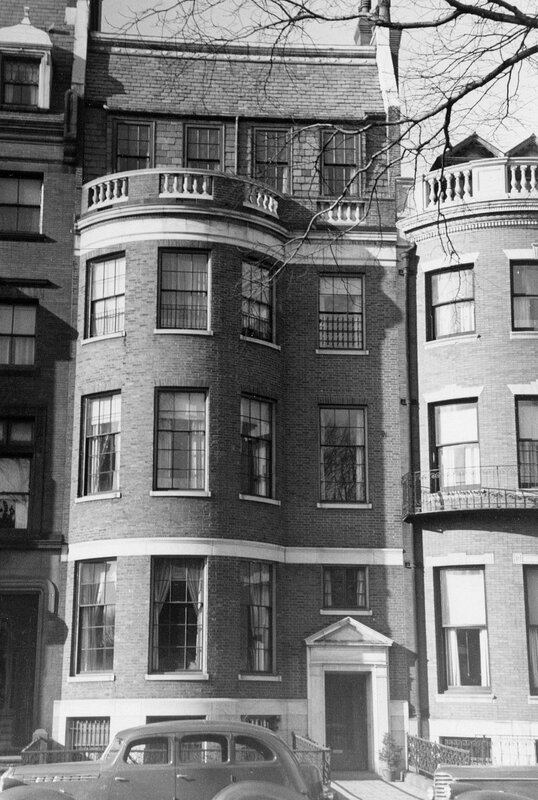 After their marriage, they lived at the Lenox Hotel at 61 Exeter. 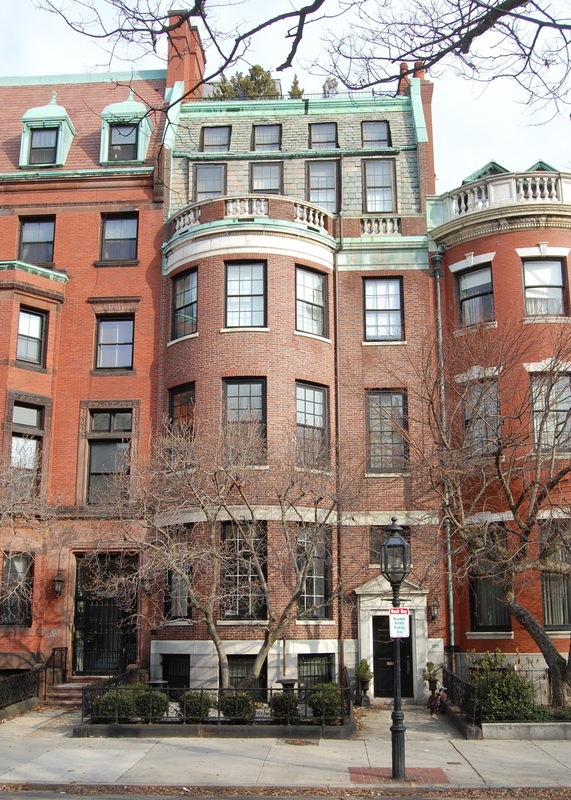 Georgie Morse continued to live at 203 Commonwealth during the 1917-1918 winter season, but moved thereafter to the Copley Plaza Hotel, where she continued to live until her death in October of 1924. By 1923, 203 Commonwealth was the home of Mrs. Julia Copeland (Kelley) Gillmor (Gillmore), the widow of Percy Howe Gillmor of St. George, New Brunswick, a commercial traveler who had died in May of 1915. Based on the Boston Lists of Residents, it appears that she provided lodgings for female students. She continued to live at 203 Commonwealth in 1927, but was no longer living there in 1928. On March 4, 1925, 203 Commonwealth was acquired from the Old Colony Trust Company, trustees of Georgie Morse’s estate, by real estate dealer Henry C. Brookings. The next day, he transferred the property back to the Old Colony Trust Company as trustees of the Phineas W. Sprague Insurance Trust. Phineas Warren Sprague was a wholesale coal merchant. He and his wife, Elizabeth Sumner (Shaw) Sprague, lived next door, at 199 Commonwealth. In July of 1929, Phineas Sprague applied for (and subsequently received) permission to remodel the front façade of the house and make various interior changes. The remodeling was designed by architect William H. Cox. 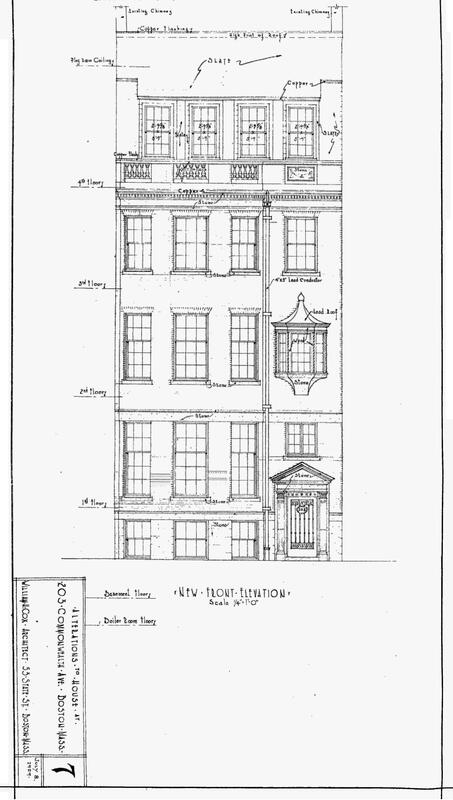 Architectural plans for the remodeling — including elevations, floor plans, and framing plans — are included in the City of Boston Blueprints Collection in the Boston Public Library’s Arts Department (reference BIN P-67). By the 1928-1929 winter season, 203 Commonwealth had become the home of Phineas and Elizabeth Spragues’ son-in-law and daughter, Daniel Simonds, II, and Elizabeth Shaw Sprague. They had married in June of 1928, after which they had lived at 116 Charles. They also maintained a home in Prout’s Neck, Maine (where the Spragues also maintained a home). Daniel Simonds was chairman of the board and president of the Simonds Saw and Steel Company in Fitchburg. On April 28, 1930, the Old Colony Trust Company transferred 203 Commonwealth to Elizabeth (Shaw) Sprague, and on December 23, 1936, she transferred the property to her daughter, Elizabeth (Sprague) Simonds. During World War II, Daniel Simonds served as a Lt. Colonel in the US Army, stationed in Washington DC. Daniel and Elizabeth Simonds divorced in the early 1940s, and he remarried in October of 1943 to Mrs. Hope (Richardson) Whitney, the former wife of Howard F. Whitney, Jr.
Elizabeth Simonds continued to live at 203 Commonwealth. In October of 1946, she married New York investment banker Andrew Varick Stout, Jr., and they moved to Stamford, Connecticut. At the time of their marriage, she was a resident of Cape Elizabeth, Maine. On June 11, 1947, Elizabeth (Shaw) Simonds Stout transferred 203 Commonwealth back to her mother. On June 1, 1949, 203 Commonwealth was purchased from Elizabeth Sprague by Massachusetts Memorial Hospitals, Inc., operators of the Boston University’s hospitals and medical services. In October of 1949, it also purchased 205 Commonwealth. In August of 1949, Elizabeth Sprague and Massachusetts Memorial Hospitals jointly filed for (and subsequently received) permission to combine 203 Commonwealth and 205 Commonwealth, add a fifth story to 203 Commonwealth, and convert the combined building into offices and laboratories for examination, study and treatment, including minor surgery. The remodeling was designed by architects Campbell & Aldrich (Walter E. Campbell and Nelson W. Aldrich), with the client shown on the plans as the Smithwick Foundation. Architectural plans for the remodeling — including floor plans and a building section — are included in the City of Boston Blueprints Collection in the Boston Public Library’s Arts Department (reference BIN R-108).